In our world full of vanity, everybody at a certain point needs a break. 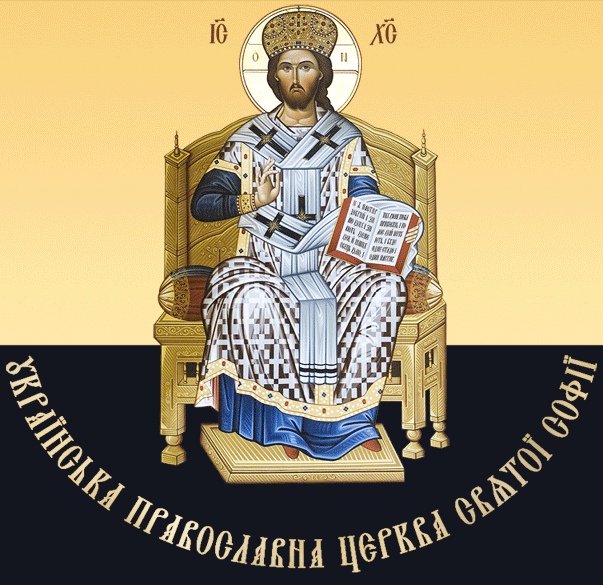 Parishioners of the Church of Saint Sophia in Waterloo, Ontario and their Brothers and Sisters in Christ in the Eparchies of the Ukrainian Orthodox Church of Canada have a unique opportunity to find refuge from daily routine and to get closer to eternal matters during the regular visits to Orthodox Monasteries, organized by Saint Sophia’s spiritual pastor, Reverend Father Myroslav Shmyhelskyy. Both Saint Kosmas Aitolos Greek Orthodox Monastery in Bolton, Ontario and Holy Transfiguration Serbian Orthodox Monastery in Milton, Ontario are situated in picturesque woods “far from the madding crowd” — yet close enough to afford Orthodox Christians from nearby cities a chance to visit and draw closer to God in centers of humility and quiet prayer. The monasteries welcome everyone who wishes to find out more about monastic life; who is drawn to worship; or wishes to venerate the monasteries’ Holy Relics. Among the faithful of Saint Sophia’s church are those who have committed themselves to journeying to monasteries farther afield — giving praise and worshiping God at Mount Athos, at the monasteries in the United States, in Thessaloniki, in Jerusalem, at Pochaiev, at the Lavra in Kyiv. 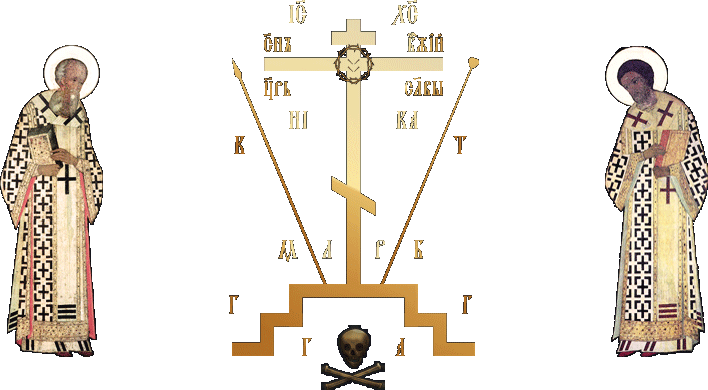 St. Anthony’s Greek Orthodox Monastery — Florence, Arizona. Holy Trinity Monastery Greek Orthodox Monastery — Smith Creek, Michigan. St. Nektarios Greek Orthodox Monastery — Roscoe, New York. Holy Transfiguration Serbian Orthodox Monastery — Milton, Ontario. St. Sabbas the Sanctified Monastery — Harper Woods, Michigan. Holy Trinity Monastery — Jordanville, New York. Monastery of the Virgin Mary the Consolatory — Brownsburg-Chatham, Quebec. St. Kosmas Aitolos Greek Orthodox Monastery — Bolton, Ontario. Dormition of the Mother of God Monastery — Rives Junction, Michigan. 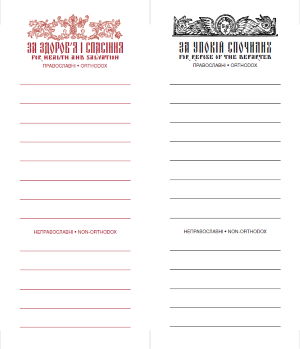 Download, print, and write the names of the living and the departed for the Proskomedia — the Liturgy of Preparation. Week-in and week-out, the parishioners of the Ukrainian Orthodox Church of St. Sophia in Waterloo work to help feed, clothe and comfort the hungry, the poor, the sick, the elderly and lonely in the Kitchener-Waterloo area — home to our community of worship and prayer for more than 60 years. Your donation helps this good work continue. 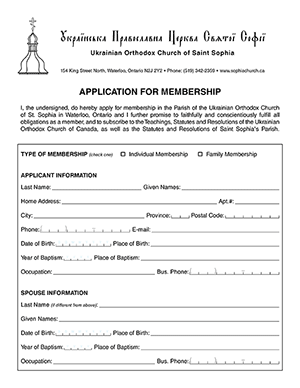 Apply for membership to join St. Sophia's Orthodox community.